Happy December! I’m excited to introduce the next shop in our Etsy feature- Green Beansie Cards. As mentioned in my Holiday Countdown series, I’m a huge fan of customized cards. When I came across this shop I was captivated by the beautiful color combinations, unique patterns and variety of print options. Who’s Behind Green Beansie Cards? Wendy has a flair for design that started as a kid. Although she wanted a career that allowed her to be creative, she didn’t get her start in graphic design. Instead, she entered the interior design program at college and received her bachelor’s degree. While working in commercial design and architecture, she spent countless hours using drafting and design software on a daily basis. At the time she didn’t know it, but this was honing her computer and professional correspondence skills, which would later prove to be very important. Fast forward a few years and Wendy’s interest in interior design started to fade. She considered becoming a doctor (in fact she completed pre-med and the MCAT), a career she thought would contribute to society in a big way and be very rewarding. 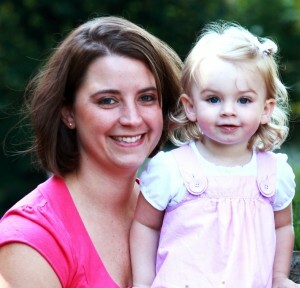 However, after becoming a mother, she was given more fulfillment than she ever could’ve imagined and suddenly becoming a doctor wasn’t high on her list of priorities. After relocating with her husband to Colorado, in a town with no family or friends, Wendy needed something to keep herself busy. She began playing around with Photoshop and her graphic designs started to emerge. Wendy has always been inspired by successful career-oriented women and thought this is the path she’d take. However, after having two children (now a 4 year old and 3 month old), she undoubtedly wanted to be home with them while they were young. She decided that an online shop would be the perfect compromise. She toiled with the idea for a while, but didn’t know exactly what to sell. One night it finally clicked and on a whim she ended up opening her shop with some card designs she had previously made for friends. Although she only had seven items at the time, she worked very hard to add one item a day for a few months, eventually adding full party packages, stationery, and professional printing services. Wendy loves graphic design because she can try all sorts of designs and change them rather easily- something that’s much more challenging (and expensive) to do as an interior designer. She describes her personality as being somewhat subdued, calm and orderly and she has a tendency to see things as black or white. As a result, her work style follows that. Her designs are usually symmetric, orderly and done in classic color combinations. Because of this, she favors designing elegant baby showers and adult parties over playful children’s parties. Although Wendy’s formal training helps her design process, she finds inspiration in many forms. For instance, she’ll see an eye-catching outfit or a beautifully decorated room and love the color combination so much that she uses it in one of her designs. Or she’ll think of a place she loves and sets out to capture that feeling in a design. Sometimes she’s hired for custom work and uses her skills to decipher the client’s thoughts and ideas to create the perfect design. She finds that very rewarding. Although Wendy loves many of her designs, her favorite is the new Christmas Fair Isle Collection. She loves the red and turquoise color scheme, as well as the props she found. The milk bottle is from her great grandfather’s dairy farm and the fondant toppers and custom cookies were ordered to perfectly coordinate with the printables. 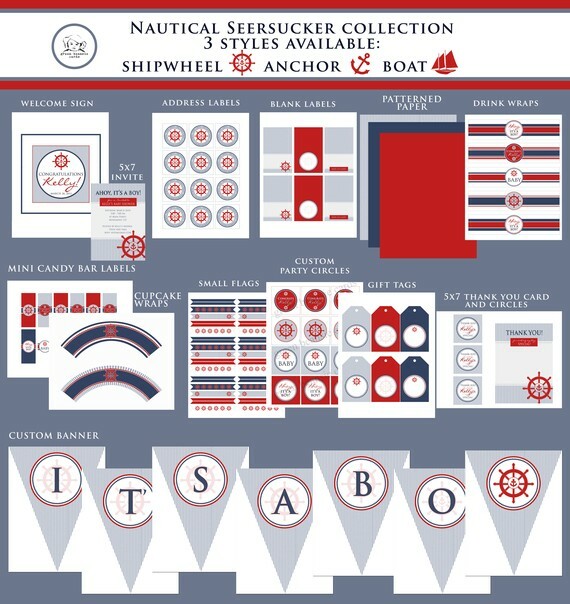 Wendy’s best sellers are her nautical collections. 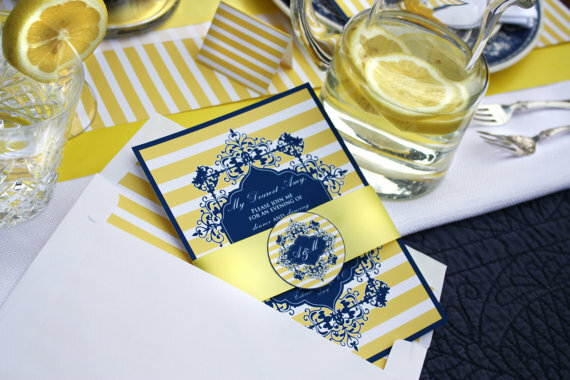 Her Kate Spade inspired invitation was featured on Amy Atlas. She has always loved the ocean, sailboats and the beach and really wanted to move to the coast when they were making the big decision to relocate. However, her husband’s job took them to the mountains instead. Someday she hopes to live by the ocean, but designing nautical inspired products gives her the “fix” for now. She’s going to be working on further developing this line in the new year. Wendy was recently featured as one of Martha Stewart’s Doers of the Week. You can also see her work showcased on her Green Beansie Blog. What does Wendy love most about creating Green Beansie Cards? Wendy is generously giving away a $30 credit to use towards anything in her shop. To be entered: visit Green Beansie Cards on Etsy and come back and leave a comment below about which products you like the most. Your information is kept strictly confident and is used for award purposes only. Open to residents of Canada and US. Contest closes Sunday, December 4 at 8 pm MST. Winner will be announced on Monday, December 5. If winner does not claim within 48 hours, another name is randomly selected. Wendy will be offering some big promotions (up to 50%) this holiday season. Check her Facebook Page often for details. I think her designs would be perfect for your holiday cards or invitations. I truly admire Wendy for creating a business that allows her to be creative and balance life with her family. Is there something you’ve been wanting to start, but don’t have the courage? Sometimes all it takes is that initial leap of faith and the rest will follow! 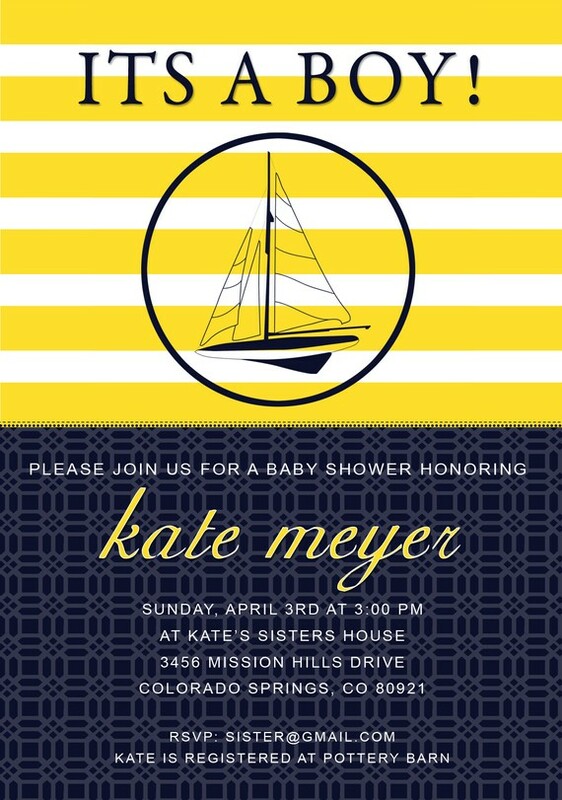 I adore the Kate Spade Nautical invitation! 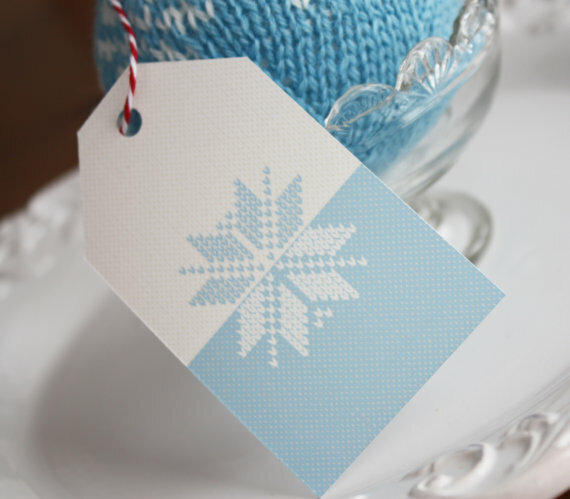 I love the Fair Isle Gift tags! I love all of the torquiose and red Christmas printable, especially the skiing snowman – so adorable and in my kitchen color scheme! I shared this giveaway post on my FB page. Love Love Love the Cozy Night Winter or Holiday Party Invitations – sooo adorable!!!! 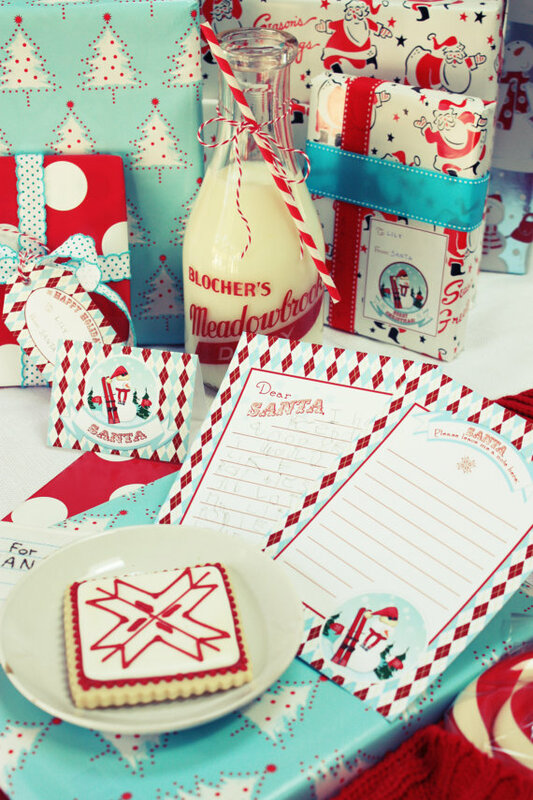 Loving the Skiing Snowman Printable Fair Isle Party Collection!! My kids would love something like that to put out for Santa on Christmas morning. Thank you for the ideas!!! What a great feature. I love that Wendy’s attraction to the beach created her nautical cards. They’re beautiful. The Fair Isle collection is darling! I think we all could use a little beach right now! I love the Fair Isle Collection, the vintage feel is very comforting. Thanks for sharing! Love the Pink Paisley printable collection! Just shared on my facebook page…facebook.com/easymadeinvitations! I love the Fair Isle Collection and Wendy’s work is beautiful! Everything looks wonderful! I especially love the Christmas Fair Isle Collection!!! I love blue and I never thought I could mix it with red! I love your project. It reminds me of all the Christmas movies or shows with Paris in them and I’ve always thought it would be nice to be there and take it all in one year! Love the monogrammed black and white cards! The Nautical party is very precious. I may have to have that for my grandson’s first birthday party.